2016 ART021 poster. Liu Wei, Untitled, 2016. Oil on canvas, 180 × 220 cm. Courtesy Liu Wei Studio and Long March Space. 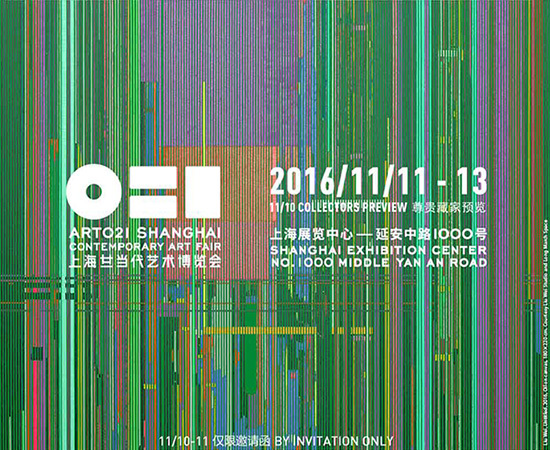 ART021 Shanghai Contemporary art fair announced today the galleries of the 4th edition, taking place at the Shanghai Exhibition Center from November 10 to 13, 2016. As an officially sanctioned project of the 18th China Shanghai International Arts Festival, this year’s fair brings together 84 of the world’s leading galleries from 18 countries and territories, showcasing today’s most significant artists across its main and special sections. 2016 ART021 consists of three major sections: Main Galleries, Approach and Beyond Public Projects. Among 200 applications, the ART021 Selection Committee chose 84 galleries to present ambitious solo and group exhibitions across its different sections. This year exhibition space will expanded to over 10,000 square meters. Focus on 21st century contemporary art, which is the main section of the fair. Among the 64 main galleries, 15 are participating for the first time at ART021: David Zwirner (New York), Greene Naftali (New York), Hauser & Wirth (Zurich), Massimo De Carlo (Milan), Kukje Gallery/Tina Kim Gallery (Seoul), Eslite Gallery (Taipei), Take Ninagawa (Tokyo), Esther Schipper/Johnen Galerie (Berlin), Galerie Balice Hertling (Paris), ONE AND J. Gallery (Seoul), GALLERY HYUNDAI (Seoul), Whitestone Gallery (Tokyo), Galerie nächst St. Stephan Rosemarie Schwarzwälder (Vienna), PIFO Gallery (Beijing), etc. Solo presentation—curated project or body of work by a single artist of any age. Curatorial project—curated group show, up to 3 individual artists. 20 galleries were chosen to participate in this section of the fair, 13 are presenting their work for the first time: 1335MABINI (Manila), SODA Gallery (Bratislava), Gallery EM (Seoul), Gallery SIDE 2 (Tokyo), 10 Chancery Lane Gallery (Hong Kong), Galerie Huit (Hong Kong), NUOART (Beijing), Inna Art Space (Hangzhou), etc. Apart from the gallery section, 2016 ART021 will host many satellite events, including special projects and talks. Details of special project and talks will be announced soon, please check official website, and official wechat account ART-021 for more information. Founded in 2013, ART021 Shanghai Contemporary Art Fair is a sanctioned project of the Shanghai International Arts Festival. ART021 brings together the top galleries, institutions, artists and their works from around the world, aiming at building a platform for galleries, institutions, collectors and sponsors. Focusing on local resources while adopting a global perspective, ART021 strives for excellence, professionalism and a high level of quality. With 2015 ART021 Shanghai Contemporary Art Fair successfully held at the Shanghai Exhibition Center for the first time, the 2016 edition will continue on its previous success and take place from November 10 to 13, 2016.